The NRC is extending the public comment period on our decommissioning rulemaking from the original date of January 4 to March 18 to allow more time for members of the public to develop and submit their comments on this important issue. The extension more than doubles the comment period from 45 to 120 days. We published an “advance notice of proposed rulemaking,” or ANPR in regulatory lingo, in the Federal Register on November 19. This was the first step toward developing a regulatory basis for a new rule on decommissioning commercial nuclear power plants. The new rule would establish clear requirements for decommissioning reactors in emergency preparedness, physical security and fitness-for-duty, among other areas, thereby reducing the need for exemptions from current requirements designed for operating reactors. It would also address the timeliness of decommissioning and the role of state and local governments and other organizations. The result would be a more efficient, open and reliable decommissioning process. Five reactors have permanently shut down since the beginning of 2013, and three more are expected to cease operations by 2019. Comments may be submitted over the federal government’s rulemaking website, www.regulations.gov, using Docket ID NRC-2015-0070. Over the past few years, five reactors have permanently stopped operation earlier than anticipated and began the process of decommissioning. A sixth will soon be joining that list, it was announced yesterday. 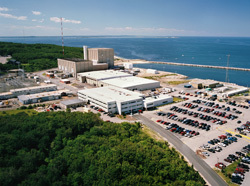 Entergy, owner of the Pilgrim nuclear power plant, announced its plan to stop operations at the Plymouth, Mass., facility no later than June 1, 2019. The nuclear plant in Oyster Creek previously announced it was shutting down in 2019. Entergy has emphasized to the NRC its commitment to safe plant operations until Pilgrim’s control rods are inserted for the last time and the unit is shut down. The company has also told us it intends to get ready for and support NRC inspection activities associated with the plant’s recent transition to Column 4 of our Action Matrix. The NRC will continue to conduct inspections and provide oversight consistent with that required of a plant in that status, with a team inspection expected sometime in 2016. More broadly, the agency will keep close watch on Pilgrim’s performance through the end of its operational life. Additional information on the agency’s oversight activities at the plant are available on the NRC’s website. There are more than a dozen units in some stage of decommissioning under NRC oversight. The NRC has traditionally used operating reactor regulations for plants undergoing decommissioning, which requires the plants to seek exemptions when the regulations for operating reactors are no longer relevant or appropriate. While this approach is sound from a safety standpoint, the Commission has directed NRC staff to initiate a process for developing a reactor decommissioning rulemaking, with a final rule to be issued by early 2019. For information on decommissioning can be found on the NRC website. Something happened last week at the Vermont Yankee nuclear power plant that might not merit headline news but is nonetheless worth highlighting: The lights were turned off for the last time in the NRC’s Resident Inspector office at the site. As is well known by now, Vermont Yankee permanently ceased operations last December, bringing to a halt power production that had begun in November 1972. Since 1978, when the Resident Inspector program was launched, the NRC has had two such inspectors assigned to the site. Among other things, these inspectors have kept close watch on day-to-day activities, responded to events, performed inspections and reviews and served as a vital conduit of information to the NRC. But commensurate with the reduced safety risk associated with a permanently shutdown reactor, the NRC has ended its daily inspector presence. 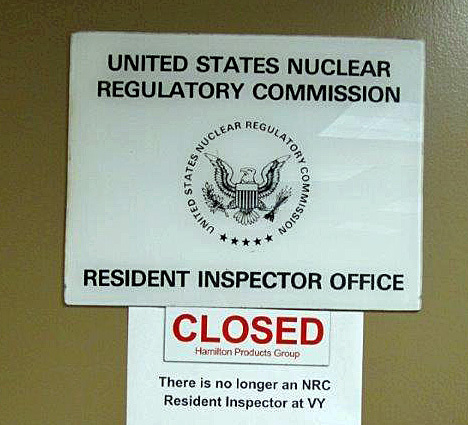 Although the Resident Inspector office has closed, NRC’s review activities have not come to a halt. Rather, the agency will continue to perform inspections at the plant on a periodic and targeted basis. For instance, whenever there is major work taking place, such as the demolition of a nuclear-related building or the removal of spent fuel stored in the plant’s spent fuel pool into dry casks, an NRC inspector will be present. In addition, NRC will conduct inspections at the site at regular intervals to check on the plant’s safety status and any key developments until all spent fuel has been removed from the site and the plant’s NRC license is terminated. Anyone seeking to contact the NRC regarding Vermont Yankee can continue to do so by calling the agency’s Region I Office via its toll-free phone number at 1-800-432-1156 and asking for the Division of Nuclear Materials Safety or by e-mail at OPA1@NRC.GOV . Vermont Yankee is not unique with respect to this change involving the Resident Inspectors assigned to the plant. Three other plants that have shut down in recent years have also seen this changeover. Almost two years after the San Onofre nuclear power plant shut down permanently, the NRC has kept an eye on what we can learn from the events that led to the plant’s closure. The latest product of this work reviews the agency’s procedures related to Southern California Edison’s (SCE) installation of new steam generators at the plant. This work builds on our response to the steam generator damage San Onofre discovered in January 2012. At the time, our inspections and reviews aimed to understand what had happened and ensure public safety would be maintained before the plant could restart. Even after SCE decided in June 2013 to shut San Onofre down, the NRC continued its reviews to try to prevent something similar from happening at other reactors. A year ago, our Executive Director for Operations asked the offices of Nuclear Reactor Regulation and New Reactors, as well as our Region IV office, to review the NRC’s own actions. The effort focused on the event and the NRC’s response to find any areas for improving our processes. The review covers issues raised in a 2014 NRC Inspector General report. The review examines eight basic topics and discusses 17 actions to enhance what are already effective tools for overseeing U.S. operating reactors. Some of the topics include: better identification of potential design issues before they lead to problems; better assurance that plants comply with our requirements in 10 CFR 50.59, “Changes, Tests, and Experiments;” and improving communications with the public. The review touched on all aspects of the NRC’s involvement in the San Onofre event, from on-site inspection to Congressional briefings, from technical review to website maintenance. The review team discussed some of these issues with industry experts. The team also sought comments from members of the public who participated in meetings about the San Onofre event and subsequent technical analyses. The review concludes, among other things, that the 50.59 process is appropriate for plant activities that replace large components, such as steam generators. The review also finds that the staff properly used a Confirmatory Action Letter as an oversight tool in responding to the San Onofre events. The staff’s already working on many of the review’s 17 actions. For instance, the staff is working on documents that clarify several areas of NRC guidance on following the 50.59 process. The NRC is also working on additional training for agency staff to improve their 50.59 reviews and associated activities. All of this ongoing work will help ensure U.S. nuclear power plants continue to safely operate, maintain and repair their systems.